“…the Church’s social teaching is itself a valid instrument of evangelization. As such, it proclaims God and his mystery of salvation in Christ to every human being, and for that very reason reveals man to himself. In this light, and only in this light, does it concern itself with everything else: the human rights of the individual, and in particular of the ‘working class’, the family and education, the duties of the State, the ordering of national and international society, economic life, culture, war and peace, and respect for life from the moment of conception until death”. The term “social justice” was coined by a Jesuit priest, Luigi Taparelli, in the 19th Century as a counter-response to the French Revolution and the de-Christianization of France by the Revolutionaries which led to the sudden loss of power of the First Estate of Louis XVI – the Clergy of the Catholic Church. Under Pope Leo XIII, the Catholic Social Doctrine was activated through the Rerum Nevarum for raising workers’ rights, including labour unionism, to prevent the Church from becoming irrelevant to progressive society. In the late industrial revolution, the term “Social Justice” began to be used more and more in the social concept and was adopted by American law-makers. From the early 20th century, it was incorporated in international law and institutions, and eventually led to the creation of the International Labour Organization. In the later 20th century, social justice was made central to the philosophy of the Social Contract, which was a theory arising from the Age of Enlightenment, a philosophical movement which gained popularity in Europe in the 18th century and was characterized by emphasis on science and reductionism and increased questioning of the religious orthodoxy and fixed dogmas of the Roman Catholic Church. This work also shows the value of Catholic social doctrine as an instrument of evangelization, because it places the human person and society in relationship with the light of the Gospel… The proclamation of Jesus Christ, the “Good News” of salvation, love, justice and peace, is not readily received in today’s world, devastated as it is by wars, poverty and injustices. For this very reason the men and women of our day have greater need than ever of the Gospel: of the faith that saves, of the hope that enlightens, of the charity that loves. The reading of these pages is suggested above all in order to sustain and foster the activity of Christians in the social sector, especially the activity of the lay faithful to whom this area belongs in a particular way; the whole of their lives must be seen as a work of evangelization that produces fruit. Every reader of “good will” will be able to understand the motives that prompt the Church to intervene with her doctrine in the social sector, an area which, at first glance, does not belong to the Church’s competence, and these same readers will see the reasons for an encounter, for dialogue, for cooperation in serving the common good… “The teaching and spreading of her social doctrine are part of the Church’s evangelizing mission”. The Church’s social doctrine “is itself a valid instrument of evangelization” and is born of the always new meeting of the Gospel message and social life. Understood in this way, this social doctrine is a distinctive way for the Church to carry out her ministry of the Word and her prophetic role. “In effect, to teach and to spread her social doctrine pertains to the Church’s evangelizing mission and is an essential part of the Christian message, since this doctrine points out the direct consequences of that message in the life of society and situates daily work and struggles for justice in the context of bearing witness to Christ the Saviour”. The above passages should make it amply clear that the Social Doctrine that the Vatican unfolded in 2004-06 was, in their own words, a “valid instrument of evangelization” with the specific objective to “permeate Society itself with the Gospel”. If this were to be done, the principles of modern democracy would need to be incorporated as “teachings of the Gospel”, never mind if some of them were in direct opposition to the teachings of the Church. It was in fact ironical that the Church was promoting human rights theories that it had rejected for several centuries. One can read the entire document here for more details. By proclaiming itself as the votary of virtually all rights of humans and appropriating them as Christian theology, it gave itself the legitimacy needed to utilize all efforts at evangelizaton as part and parcel of satisfying the needs of society itself and providing human rights to the citizens of the world. “… the Church’s social doctrine is not a privilege for her, nor a digression, a convenience or interference: it is her right to proclaim the Gospel in the context of society, to make the liberating word of the Gospel resound in the complex worlds of production, labour, business, finance, trade, politics, law, culture, social communications, where men and women live. Because of the public relevance of the Gospel and faith, because of the corrupting effects of injustice, that is, of sin, the Church cannot remain indifferent to social matters: “To the Church belongs the right always and everywhere to announce moral principles, including those pertaining to the social order, and to make judgments on any human affairs to the extent that they are required by the fundamental rights of the human person or the salvation of souls”. The Church, aware that her essentially religious mission includes the defence and promotion of human rights, “holds in high esteem the dynamic approach of today which is everywhere fostering these rights”. The Church profoundly experiences the need to respect justice and human rights within her own ranks. This pastoral commitment develops in a twofold direction: in the proclamation of the Christian foundations of human rights and in the denunciation of the violations of these rights… The Church trusts above all in the help of the Lord and his Spirit who, poured forth into human hearts, is the surest guarantee for respecting justice and human rights, and for contributing to peace. “The promotion of justice and peace and the penetration of all spheres of human society with the light and the leaven of the Gospel have always been the object of the Church’s efforts in fulfilment of the Lord’s command”. In effect, the Church smoothly appropriated the dynamic approach of the modern State and Society as a “proclamation of the Christian foundation of human rights” with the specific aim of “penetration of all spheres of human society” with the Gospel. One wonders where was this commitment to human rights when Pope Alexander VI issued the Inter Cetera papal bull, shortly after Columbus’ first voyage to the Caribbean, expressing his earnest desire that “barbarous nations be subjugated and brought to the faith itself,” “for the spread of the Christian Empire.” Or when Church backed colonialists ravaged indigenous communities in North & South America, Africa, Asia (Bharat – Goa) etc. The Compendium of the Social Doctrine of the Church goes on to describe the means to achieve this goal of promoting ‘peace’ in the light of the Gospel, through what it called “Civil Society”. It then outlines numerous aspects of social and economic activities, taking a clear stand on most, which were in line with principles of modern welfare states, and proclaimed them as the stand of the Church that inspired those principles. Rest from work is a right. As God “rested on the seventh day from all the work which he had done” (Gen 2:2), so too men and women, created in his image, are to enjoy sufficient rest and free time that will allow them to tend to their family, cultural, social and religious life. The institution of the Lord’s Day contributes to this. On Sundays and other Holy Days of Obligation, believers must refrain from “engaging in work or activities that hinder the worship owed to God, the joy proper to the Lord’s Day, the performance of the works of mercy, and the appropriate relaxation of mind and body”. Citizens are not obligated in conscience to follow the prescriptions of civil authorities if their precepts are contrary to the demands of the moral order, to the fundamental rights of persons or to the teachings of the Gospel. Unjust laws pose dramatic problems of conscience for morally upright people: when they are called to cooperate in morally evil acts they must refuse. Besides being a moral duty, such a refusal is also a basic human right which, precisely as such, civil law itself is obliged to recognize and protect. “Those who have recourse to conscientious objection must be protected not only from legal penalties but also from any negative effects on the legal, disciplinary, financial and professional plane”. The Holy See, or Apostolic See, enjoys full international subjectivity as a sovereign authority that performs acts which are juridically its own. It exercises an external sovereignty recognized within the context of the international community which reflects that exercised within the Church and is marked by organizational unity and independence. The Church makes use of the juridical means necessary or useful for carrying out her mission. It also sought to give the Pope the right to participate in intergovernmental organizations such as the UN, claiming that it “aims at offering non-partisan service to the international community, since it seeks no advantage for itself but only the good of the entire human family”. The need for a new evangelization helps the Church to understand that “today more than ever … her social message will gain credibility more immediately from the witness of action than as a result of its internal logic and consistency”. The Church’s social doctrine provides the fundamental criteria for pastoral action in the area of social activity: proclaiming the Gospel; placing the Gospel message in the context of social realities; planning actions aimed at the renewal of these realities; and conforming them to the demands of Christian morality. A new evangelization of society requires first of all the proclamation of the Gospel” … Catholic educational institutions can and indeed must carry out a precious formative service, dedicating themselves in a particular way to the inculturation of the Christian message, that is to say, to the productive encounter between the Gospel and the various branches of knowledge. The Church’s social doctrine is a necessary means for an efficacious Christian education towards love, justice and peace, as well as for a conscious maturation of moral and social duties in the various cultural and professional fields. It stressed the importance of mass media in spreading its message and imparting it “wisdom” to “save” it from “becoming a meaningless accumulation of facts”. In the promotion of an authentic culture, the laity will place great importance on mass media, examining above all the contents of the countless choices that people make… Rather than judging the means of social communication, this tradition is placed at their service: “The Church’s culture of wisdom can save the media culture of information from becoming a meaningless accumulation of facts”. It also instructed its followers to oppose legislative or political choices “contrary to Christian principles” or if not feasible to block it, to mobilize favourable Parliamentary representatives to limit the damage. It expressed its dismay that democratic societies still showed “secular intolerance” to any kind of “political or cultural relevance to religious faiths” and “exclude the activitites of Christians from the social and political spheres”, claiming that “the marginalization of Christianity … would not bode well for the future of society or for consensus among peoples; indeed, it would threaten the very spiritual and cultural foundations of civilization”. Another vital development as a result of the Compendium was the formation of an alliance between the neo-conservative Catholics and their bitter rivals, the Protestants through the realignment of the Social Doctrine. Catholics started extending legal and philosophical argumentation to the Protestants and both groups lobbied together for passage of laws based on the Gospel in different countries such as Mexico and the United States. The Compendium of Social Doctrine became a unifying force bringing together Christians of various denominations on a single platform, working for a common goal: global evangelization through Social Justice. The Church of North India is the largest Protestant body of churches, covering North, West, Central and East Bharat, with its headquarters at New Delhi. 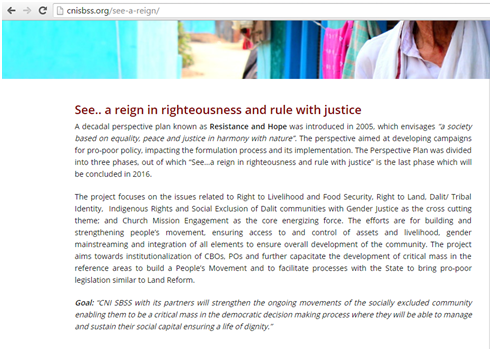 The SBSS (Synodical Board of Social Services) is its “development and justice wing” to implement the Social Doctrine in Bharat. Its target audience is the Dalit (Scheduled Castes) and Scheduled Tribes (ST) community. As of 2009, it was working with 20 Partners spread over sixteen states, in more than 1512 villages comprising of 242 Community Based Organisations, 11 People Organisations and 1813 Self Help Groups. These numbers have increased massively over the next seven years. Creating smaller organizations and eventually coalescing them into larger ones to emerge as a political force. The organizations also serve the function of influencing congregation members’ voting preferences for “suitable candidates”. Placing church-based “peoples’ organizations” as advisors to government on rights, even to the extent of monitoring the Government plans. In Odisha, it is even leading the demand for division of Odisha to form another state that will be called “Koshal”. Get elected and become a policy-maker who can be used to implement the Social Doctrine of the Church or block anything opposed to its interests. As the Church of North India’s own document shows, the execution of this plan is well under way. Hundreds of small and large organizations function under the auspices of the CNI and the SBSS, and many have coalesced to form alternative political forces in local elections. This would be perfectly acceptable in a democracy – if it weren’t for the fact that all these measures are being carried out with the express purpose of evangelization and permeating the entire society with the Gospel. Under the ten-year plan, individual sub-plans are being carried out every year with focused attention on select issues for the entire year. The evangelical program of the Generic Church (Catholic, Protestant and all sects) is now well under way, and has entered the next phase where we expect large scale conversions to the “reign of righteousness”. The battleground: Dalits and tribals. Massive mobilization is being carried out for capacity-building, creating representatives and influencing local leaders across hundreds of villages. 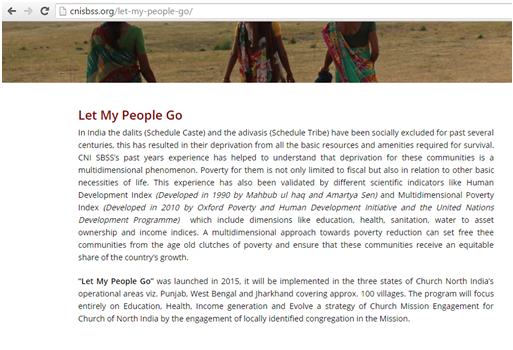 The latest part of this campaign is “Let My People Go!” which has already commenced in 2015, which concentrates on Dalit “liberation” and agitations. This may explain the sudden increase in media outrage on Dalit issues over the past year. 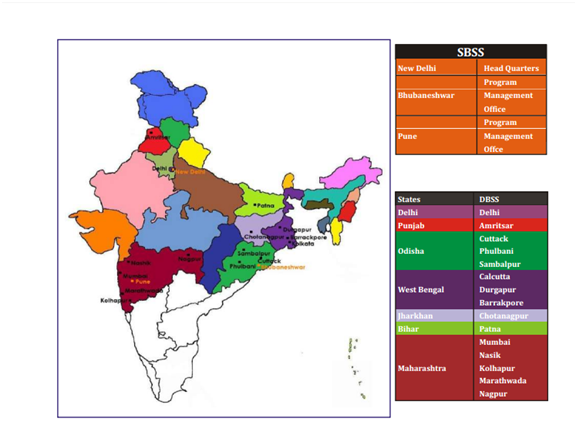 An examination of the finances of the SBSS shows that its activities are almost entirely funded by international Christian organizations through the FCRA route. The major contributors are Christian Aid and Caritas – the latter was put on watch list recently by the Government for violations. 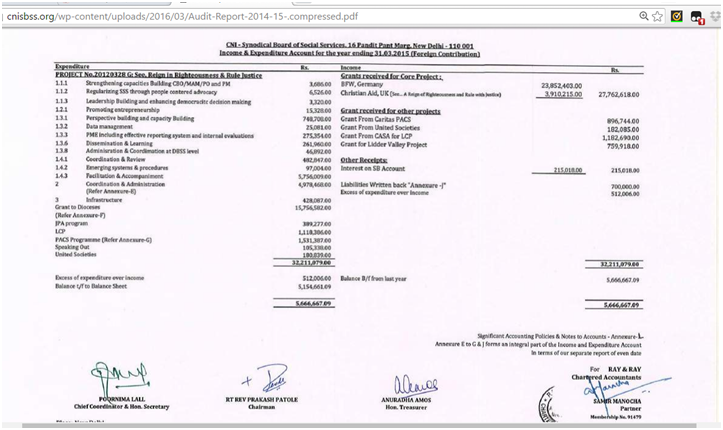 Income & Expenditure account for CNI-SBSS, FY 2015. Note the detailed planning in execution of plans. As will be obvious from the above, the Generic Church having incorporated Social Justice into its mandate, is well underway to permeate, as it has planned, the Gospel into the very fabric of society itself. 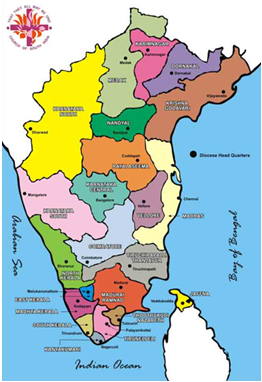 The route it is taking is to create ‘rights-based’ movements, instigate and facilitate agitations against industries and government on various local issues (real or manufactured), lead movements for implementation of government social schemes and create grassroots level leaders from sections of society for alternative political leadership. It must be kept in mind that this leadership emerges from the congregation of the Church and is answerable to a Sovereign of another country, with specific instructions to oppose anything that is against the Doctrine of the Church by whichever means available. The larger goal is global evangelization, and social justice is only a means to the end. The question therefore, must be asked whether this is really in favour of Bharat. Whether the Government of the day will allow a religious institution ruled by a sovereign monarch the liberty of pervading its own society with its people, its thoughts, its morals and whether it will allow people under the direct command of a foreign sovereign monarch to make crucial legislative and administrative decisions for the nation. This question is one on which the survival of Bharat, and Hindu Dharma, rests. Will our leaders wake up and start taking efforts to dismantle this imminent threat to the nation, or let it be colonized by the New Evangelization? Practising surgeon, musician, social activist, amateur photographer. Convener, BJP Doctors Cell Mumbai.